When considering medical and dental treatments abroad, Latvia should be at the top of your list. Located in Northern Europe, a member of the European Union, Latvia offers the most modern and reliable health services to patients from around the world. Combine your treatment with world-class postoperative and rehabilitation services and facilities, and include sightseeing, rest and relaxation in the European Capital of Culture of 2014, a UNESCO World Heritage Site. 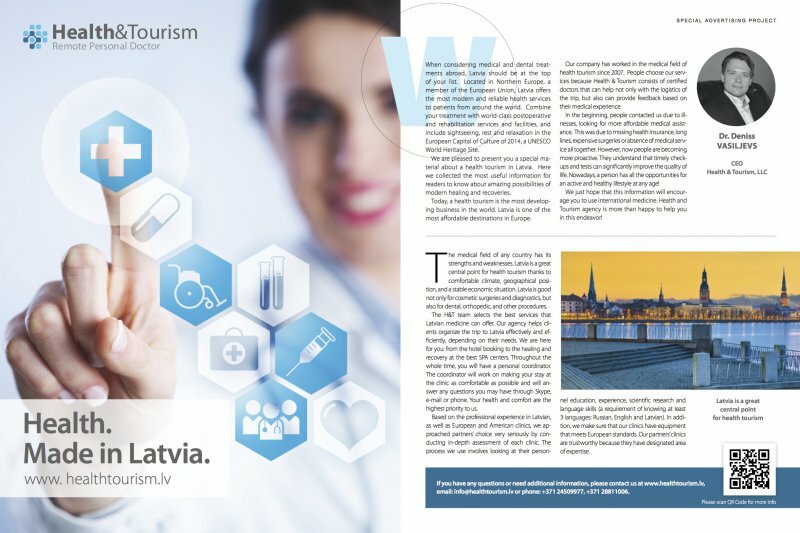 We are pleased to present you a special material about a health tourism in Latvia. Here we collected the most useful information for readers to know about amazing possibilities of modern healing and recoveries. Today, a health tourism is the most developing business in the world. Latvia is one of the most affordable destinations in Europe. Our company has worked in the medical field of health tourism since 2007. People choose our services because Health & Tourism consists of certified doctors that can help not only with the logistics of the trip, but also can provide feedback based on their medical experience. In the beginning, people contacted us due to illnesses, looking for more affordable medical assistance. This was due to missing health insurance, long lines, expensive surgeries or absence of medical service all together. However, now people are becoming more proactive. They understand that timely check-ups and tests can significantly improve the quality of life. Nowadays, a person has all the opportunities for an active and healthy lifestyle at any age! We just hope that this information will encourage you to use international medicine. Health and Tourism agency is more than happy to help you in this endeavor! The medical field of any country has its strengths and weaknesses. Latvia is a great central point for health tourism thanks to comfortable climate, geographical position, and a stable economic situation. 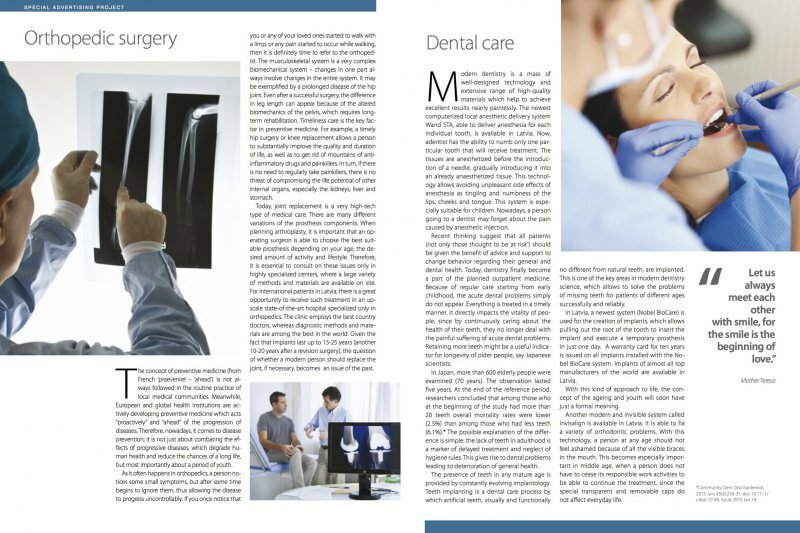 Latvia is good not only for cosmetic surgeries and diagnostics, but also for dental, orthopedic, and other procedures. The H&T team selects the best services that Latvian medicine can offer. Our agency helps clients organize the trip to Latvia effectively and efficiently, depending on their needs. We are here for you: from the hotel booking to the healing and recovery at the best SPA centers. Throughout the whole time, you will have a personal coordinator. The coordinator will work on making your stay at the clinic as comfortable as possible and will answer any questions you may have through Skype, e-mail or phone. Your health and comfort are the highest priority to us. Based on the professional experience in Latvian, as well as European and American clinics, we approached partners’ choice very seriously by conducting in-depth assessment of each clinic. The process we use involves looking at their personnel education, experience, scientific research and language skills (a requirement of knowing at least 3 languages: Russian, English and Latvian). In addition, we make sure that our clinics have equipment that meets European standards. Our partners’ clinics are trustworthy because they have designated area of expertise. email: info@healthtourism.lv or phone: 371 24509977, 371 28811006. The future is already possible now! 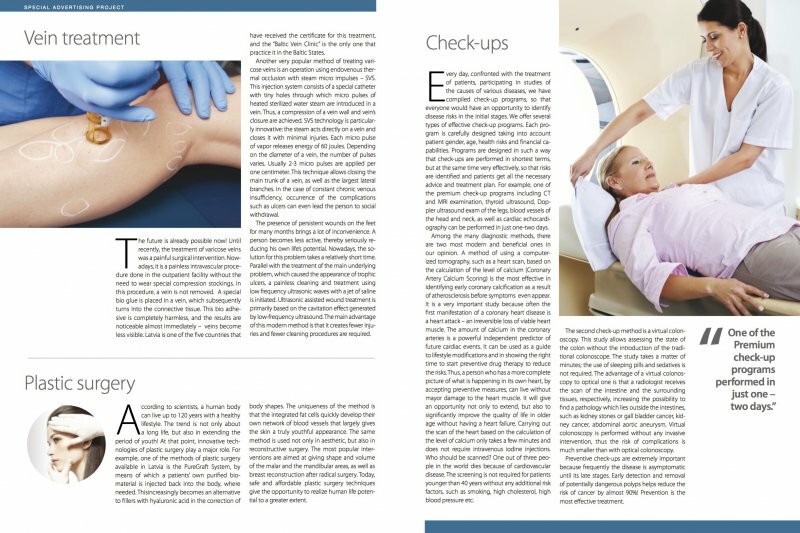 Until recently, the treatment of varicose veins was a painful surgical intervention. Nowadays, it is a painless intravascular procedure done in the outpatient facility without the need to wear special compression stockings. In this procedure, a vein is not removed. A special bio glue is placed in a vein, which subsequently turns into the connective tissue. This bio adhesive is completely harmless, and the results are noticeable almost immediately – veins become less visible. Latvia is one of the five countries that have received the certificate for this treatment, and the “Baltic Vein Clinic” is the only one that practice it in the Baltic States. Another very popular method of treating varicose veins is an operation using endovenous thermal occlusion with steam micro impulses – SVS. This injection system consists of a special catheter with tiny holes through which micro pulses of heated sterilized water steam are introduced in a vein. Thus, a compression of a vein wall and vein’s closure are achieved. SVS technology is particularly innovative: the steam acts directly on a vein and closes it with minimal injuries. Each micro pulse of vapor releases energy of 60 joules. Depending on the diameter of a vein, the number of pulses varies. Usually 2-3 micro pulses are applied per one centimeter. This technique allows closing the main trunk of a vein, as well as the largest lateral branches. In the case of constant chronic venous insufficiency, occurrence of the complications such as ulcers can even lead the person to social withdrawal. The presence of persistent wounds on the feet for many months brings a lot of inconvenience. A person becomes less active, thereby seriously reducing his own life’s potential. Nowadays, the solution for this problem takes a relatively short time. Parallel with the treatment of the main underlying problem, which caused the appearance of trophic ulcers, a painless cleaning and treatment using low frequency ultrasonic waves with a jet of saline is initiated. Ultrasonic assisted wound treatment is primarily based on the cavitation effect generated by low-frequency ultrasound. The main advantage of this modern method is that it creates fewer injuries and fewer cleaning procedures are required. According to scientists, a human body can live up to 120 years with a healthy lifestyle. The trend is not only about a long life, but also in extending the period of youth! At that point, innovative technologies of plastic surgery play a major role. For example, one of the methods of plastic surgery available in Latvia is the PureGraft System, by means of which a patients’ own purified biomaterial is injected back into the body, where needed. Thisincreasingly becomes an alternative to fillers with hyaluronic acid in the correction of body shapes. The uniqueness of the method is that the integrated fat cells quickly develop their own network of blood vessels that largely gives the skin a truly youthful appearance. The same method is used not only in aesthetic, but also in reconstructive surgery. The most popular interventions are aimed at giving shape and volume of the malar and the mandibular areas, as well as breast reconstruction after radical surgery. Today, safe and affordable plastic surgery techniques give the opportunity to realize human life potential to a greater extent. Every day, confronted with the treatment of patients, participating in studies of the causes of various diseases, we have compiled check-up programs, so that everyone would have an opportunity to identify disease risks in the initial stages. We offer several types of effective check-up programs. Each program is carefully designed taking into account patient gender, age, health risks and financial capabilities. Programs are designed in such a way that check-ups are performed in shortest terms, but at the same time very effectively, so that risks are identified and patients get all the necessary advice and treatment plan. For example, one of the premium check-up programs including CT and MRI examination, thyroid ultrasound, Doppler ultrasound exam of the legs, blood vessels of the head and neck, as well as cardiac echocardiography can be performed in just one-two days. Among the many diagnostic methods, there are two most modern and beneficial ones in our opinion. A method of using a computerized tomography, such as a heart scan, based on the calculation of the level of calcium (Coronary Artery Calcium Scoring) is the most effective in identifying early coronary calcification as a result of atherosclerosis before symptoms even appear. It is a very important study because often the first manifestation of a coronary heart disease is a heart attack – an irreversible loss of viable heart muscle. The amount of calcium in the coronary arteries is a powerful independent predictor of future cardiac events. It can be used as a guide to lifestyle modifications and in showing the right time to start preventive drug therapy to reduce the risks. Thus, a person who has a more complete picture of what is happening in its own heart, by accepting preventive measures, can live without mayor damage to the heart muscle. It will give an opportunity not only to extend, but also to significantly improve the quality of life in older age without having a heart failure. Carrying out the scan of the heart based on the calculation of the level of calcium only takes a few minutes and does not require intravenous iodine injections. Who should be scanned? One out of three people in the world dies because of cardiovascular disease. The screening is not required for patients younger than 40 years without any additional risk factors, such as smoking, high cholesterol, high blood pressure etc. The second check-up method is a virtual colonoscopy. This study allows assessing the state of the colon without the introduction of the traditional colonoscope. The study takes a matter of minutes; the use of sleeping pills and sedatives is not required. The advantage of a virtual colonoscopy to optical one is that a radiologist receives the scan of the intestine and the surrounding tissues, respectively, increasing the possibility to find a pathology which lies outside the intestines, such as kidney stones or gall bladder cancer, kidney cancer, abdominal aortic aneurysm. Virtual colonoscopy is performed without any invasive intervention, thus the risk of complications is much smaller than with optical colonoscopy. Preventive check-ups are extremely important because frequently the disease is asymptomatic until its late stages. Early detection and removal of potentially dangerous polyps helps reduce the risk of cancer by almost 90%! Prevention is the most effective treatment. The concept of preventive medicine (from French ‘praevenire’ – ‘ahead’) is not always followed in the routine practice of local medical communities. Meanwhile, European and global health institutions are actively developing preventive medicine which acts “proactively” and “ahead” of the progression of diseases. Therefore, nowadays, it comes to disease prevention; it is not just about combating the effects of progressive diseases, which degrade human health and reduce the chances of a long life, but most importantly about a period of youth. As it often happens in orthopedics, a person notices some small symptoms, but after some time begins to ignore them, thus allowing the disease to progress uncontrollably. If you once notice that you or any of your loved ones started to walk with a limp, or any pain started to occur while walking, then it is definitely time to refer to the orthopedist. The musculoskeletal system is a very complex biomechanical system – changes in one part always involve changes in the entire system. It may be exemplified by a prolonged disease of the hip joint. Even after a successful surgery, the difference in leg length can appear because of the altered biomechanics of the pelvis, which requires long-term rehabilitation. Timeliness care is the key factor in preventive medicine. For example, a timely hip surgery or knee replacement allows a person to substantially improve the quality and duration of life, as well as to get rid of mountains of anti-inflammatory drugs and painkillers. In turn, if there is no need to regularly take painkillers, there is no threat of compromising the life potential of other internal organs, especially the kidneys, liver and stomach. Today, joint replacement is a very high-tech type of medical care. There are many different variations of the prosthesis components. When planning arthroplasty, it is important that an operating surgeon is able to choose the best suitable prosthesis depending on your age, the desired amount of activity and lifestyle. Therefore, it is essential to consult on these issues only in highly specialized centers, where a large variety of methods and materials are available on site. For international patients in Latvia, there is a great opportunity to receive such treatment in an upscale state-of-the-art hospital specialized only in orthopedics. The clinic employs the best country doctors, whereas diagnostic methods and materials are among the best in the world. Given the fact that implants last up to 15-25 years (another 10-20 years after a revision surgery), the question of whether a modern person should replace the joint, if necessary, becomes an issue of the past. Modern dentistry is a mass of well-designed technology and extensive range of high-quality materials which help to achieve excellent results nearly painlessly. The newest computerized local anesthetic delivery system Wand STA, able to deliver anesthesia for each individual tooth, is available in Latvia. Now, adentist has the ability to numb only one particular tooth that will receive treatment. The tissues are anesthetized before the introduction of a needle, gradually introducing it into an already anaesthetized tissue. This technology allows avoiding unpleasant side effects of anesthesia as tingling and numbness of the lips, cheeks and tongue. This system is especially suitable for children. Nowadays, a person going to a dentist may forget about the pain caused by anesthetic injection. Recent thinking suggest that all patients (not only those thought to be ‘at risk’) should be given the benefit of advice and support to change behavior regarding their general and dental health. Today, dentistry finally become a part of the planned outpatient medicine. Because of regular care starting from early childhood, the acute dental problems simply do not appear. Everything is treated in a timely manner. It directly impacts the vitality of people, since by continuously caring about the health of their teeth, they no longer deal with the painful suffering of acute dental problems. Retaining more teeth might be a useful indicator for longevity of older people, say Japanese scientists. In Japan, more than 600 elderly people were examined (70 years). The observation lasted five years. At the end of the reference period, researchers concluded that among those who at the beginning of the study had more than 20 teeth overall mortality rates were lower (2.5%) than among those who had less teeth (6.1%). * The possible explanation of the difference is simple: the lack of teeth in adulthood is a marker of delayed treatment and neglect of hygiene rules. This gives rise to dental problems leading to deterioration of general health. The presence of teeth in any mature age is provided by constantly evolving implantology. Teeth implanting is a dental care process by which artificial teeth, visually and functionally no different from natural teeth, are implanted. This is one of the key areas in modern dentistry science, which allows to solve the problems of missing teeth for patients of different ages successfully and reliably. In Latvia, a newest system (Nobel BioCare) is used for the creation of implants, which allows pulling out the root of the tooth to insert the implant and execute a temporary prosthesis in just one day. A warranty card for ten years is issued on all implants installed with the Nobel BioCare system. Implants of almost all top manufacturers of the world are available in Latvia. With this kind of approach to life, the concept of the ageing and youth will soon have just a formal meaning. Another modern and invisible system called Invisalign is available in Latvia. It is able to fix a variety of orthodontic problems. With this technology, a person at any age should not feel ashamed because of all the visible braces in the mouth. This becomes especially important in middle age, when a person does not have to cease its responsible work activities to be able to continue the treatment, since the special transparent and removable caps do not affect everyday life. resource on our blog alychidesigns.com ? resource on our blog alychidesign.com ? a resource on our blog alychidesign.com ? approved as a do follow link.